In early 2013, Move One handled a massive oil and gas pipe shipment, originating in the United States and destined for Afghanistan. The shipment, a gift from the US Military to the Afghan government, involved 1,120 pieces of pipe, each weighing 645 kgs. The total weight handled and delivered equaled 722,909 kgs. The pipes bound for Afghanistan were shipped ocean freight to Aqaba, Jordan where the pipes were palletized 5 wide by 4 high on 2 x 20 ft connected pallets. Each flight carried 5 of these 40 ft pallets. To transport all 1,120 pieces, a total of 9 flights were required in a period of 15 days. From Jordan, the pipes were then flown into Camp Marmal in Mazar, Afghanistan where Move One handled the difficult depalletization. Moving each pipe required precise coordination and balance to ensure safety and preserve the pipes original condition. All personnel had to ensure that the surface of the pipes did not get scratched. This was an incredibly delicate process that required taking the necessary time to ensure the cargo was not damaged. As a result, the build up for one flight worth of cargo took 12-24 hours at origin and 3-5 hours to off-load at destination. Due to the unique nature of the shipment, the wooden shoring, chocks, and end stoppers holding the pipes together were custom manufactured for this one mission and 30-40 powerful straps were used to secure the cargo. 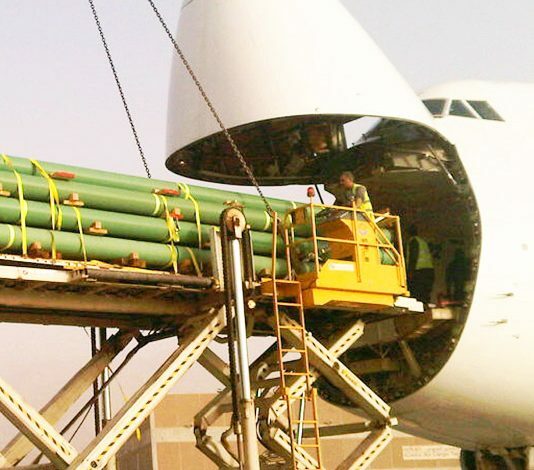 After arriving in Mazar, Move One successfully off-loaded and transported the shipment to final destination where the pipes were depalletized.